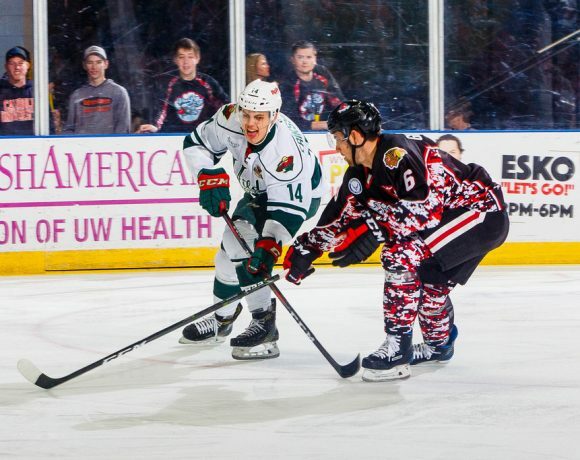 The Rockford IceHogs got a boost from Vinnie Hinostroza this past week. It doesn’t show much on the score sheet; Hinostroza was credited with a single assist in the three games he played while he and several Blackhawks teammates were sent to Rockford this past week. The Hogs had won three straight before Vinnie came to town, extending that streak to a season-high five games before being shut out by Charlotte Saturday night. How can I point to him as making such a big difference? Simple. Speed. Hinostroza was sent down for the Hawks bye week, along with Tanner Kero, Nick Schmaltz and Gustav Forsling. Kero and Schmaltz never saw a second of ice time. Forsberg, who also played in all three games at the BMO this past week, is still in Rockford. Together with Hinostroza, the two added a dimension that has been sorely lacking this season. Again, it isn’t readily apparent by looking at the box score, but there was a reprieve from the grind-it-out mentality of most of the first five months of a losing campaign. The IceHogs weren’t just hoping for a deflection or a fortunate bounce. Every time Hinostroza was on the ice (which was often because coach Ted Dent went with 11 forwards in two of the contests), there was a definite increase in operating space. The passing was as sharp as I’ve seen it all year. Several players got into the tape-to-tape act. All of a sudden, this was a team that had some giddy-up. It showed what a difference just a couple of prospects with some decent wheels could have made for Rockford this season. It also lends to optimism when you figure that a host of Hawks prospects will be playing for the Hogs, possibly as soon as this spring. 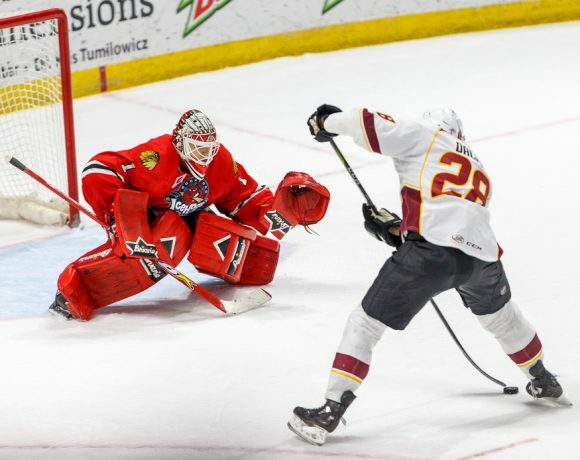 The high water mark for Rockford was Friday night, when they absolutely dominated the Cleveland Monsters. 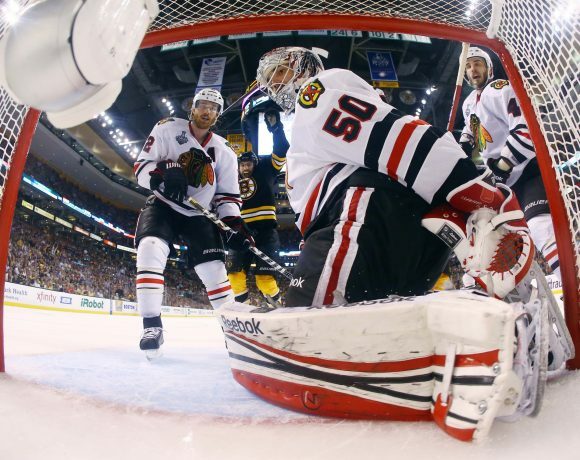 The Hogs barraged Monsters goalie Anton Forsberg with 43 shots on the way to a 4-1 victory. It was the first time Rockford had posted four goals in a regulation tilt since December 30. The IceHogs 2-0 loss to the Checkers Saturday also snapped an eight-game points streak, also a season-high for the team. Schmaltz and Kero were recalled by Chicago on Thursday. Hinostroza went to the airport after the loss to Charlotte and was recalled by the Hawks Sunday, leaving Rockford fans with just the memories of his jets once again. Rockford has been without three veteran leaders for most of the past week. Pierre-Cedric Labrie hasn’t returned to action since coming out of the February 11 game with San Antonio. Labrie was healthy enough to sign items in the concourse Saturday on his bobble head night but has missed the last four games. Also out of the lineup all of last week was Brandon Mashinter. Captain Jake Dowell was a late scratch on Friday night and also was out for Saturday’s game. This left the Hogs some leadership openings; Spencer Abbott donned an “A” on his sweater the past two games. In addition, F Chris DeSousa has been recalled from the ECHL’s Indy Fuel. The Hogs picked up their fourth-straight victory in this year’s 10:30 a.m. start for the kiddies. Jeff Glass pitched his second shutout of the season for Rockford. Glass stopped 37 Monsters shots to pick up the game’s First Star. Second Star was Tyler Motte, who potted the game-winner early in the second period. Rockford started the middle frame with a man advantage left over from the opening period. Kyle Baun got in front of the net to send a shot off of Cleveland goalie Anton Forsberg. From there, it was Motte On The Spot. The rebound came right out to Motte at the left post for an easy putback. The Hogs led 1-0 at the 1:05 mark. It was largely Glass for the rest of the mid-day tilt; the Monsters threw 29 shots at him the rest of the way but could not get a puck over the goal line. Martin Lundberg locked it up with an empty-netter with 1:14 remaining in the game. Unlike Wednesday’s matchup, the scoreboard got a workout early in the contest. Not quite three minutes into the game, Vinnie Hinostroza took a pass from Robin Norell and turned on the jets. He got to the left post before passing to Evan Mosey, who was waiting at the opposite post. Finding the back of the net, Mosey gave Rockford a 1-0 lead at the 2:57 mark. The Hogs second goal came from the stick of Jeremy Langlois, who put back a rebound of a Luke Johnson shot at 5:24 of the first. Cleveland struck back with a goal by Markus Hannikainen but Rockford was still up 2-1 at the first intermission. 13:30 into the second period, Mosey set up Martin Lundberg at the top of the right circle. Langlois got a piece of the shot from the doorstep, knocking the puck past Forsberg for a 3-1 IceHogs advantage. A moment later, Abbott got the puck from Erik Gustafsson at the left circle. Maneuvering to the high slot, Abbott zipped a wrist shot past Forsberg to put Rockford up 4-1. From there, the IceHogs coasted to victory. Lars Johansson had 35 saves on the night to keep Rockford in control. Former IceHogs goalie Michael Leighton was not available to oppose the Hogs. However, Alex Nedeljkovic still posted a shutout, stopping all 32 Rockford shots to put an end to the Hogs five-game win streak. The only goal Charlotte would need came midway through the first period. Valentin Zykov drove right down the middle of the ice and five-holed Rockford goalie Jeff Glass. The Checkers added to the lead at 6:57 of the second when Andrew Poturalski redirected Keegan Lowe’s shot attempt. The puck trickled between the pads of Glass and across the goal line to complete the scoring for the evening. Rockford had many opportunities to punch in a goal, but Nedeljkovic made several big stops to deny the Hogs. Rockford is headed West in what will be its longest road trek of the season. They have games Tuesday and Wednesday nights in Manitoba, then head to California for games in San Diego and Ontario on Saturday and Sunday. Follow me @JonFromi on twitter to get game updates and weekday thoughts on the IceHogs all season long.